Few things ruin a nice long walk or run through your neighborhood more than stumbling on a cracked, deteriorated, or misaligned sidewalk. Not only does this broken sidewalk threaten your safety, but it also decreases the neighborhood’s beauty. 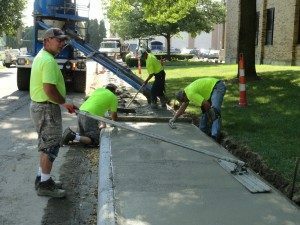 To combat this problem, the City of Kettering conducts an annual sidewalk and curb repair program. Each year a different section of the City is targeted for the program with the goal of covering the City within a 20 to 25 year period. Kettering has adopted the practice, which is common in most communities across the country, of making property owners responsible for the sidewalk, curbs, and drive approaches abutting their properties. In Ohio, state law provides for this practice on the premise that property owners get the most benefit from these items because they are available for their use, and it enhances their property’s value. So when it comes to making repairs, property owners are responsible. City Engineering Department inspectors review the sidewalk, curb, and drive a pproaches and mark the sections that must be replaced. The criteria for replacement or repair was established by City Council and has been used for several years. After the marking is completed, an explanation of the markings, a copy of the required work, an estimated cost, and the options for doing the work are sent to the affected property owners. If there is a disagreement between the Inspector and the property owner regarding replacement orders, the City Engineer will re-examine the curb, sidewalk, or drive approach in question and make the final determination. There are two options for repairing the sidewalks and curbs. First, the property owner may hire a contractor. 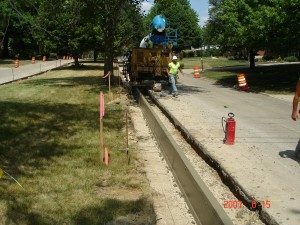 The contractor must obtain a right-of-way construction permit to replace the sidewalk, drive approach, and/or curbs. The contractor has thirty (30) days from the time the permit is issued to complete the work. The contractor must post a performance bond which will remain on file with the City for a period of 12 months. The contractor must also provide proof of insurance, listing the City of Kettering as an additional insured. The work must also have a final inspection from the City inspector. You may contact the Engineering Department at 937-296-2436 to check on contractor’s bond and insurance status. The second option for replacement is to have the contractor the City hires complete the work. In the spring of year the work is to be preformed, the resident would receive a letter stating the estimated cost. The City pays the contractor for the actual cost of the work. Once the work is completed and a final letter is sent to the property owners, the property owner may either pay cash to the City for the work or have the actual cost plus interest, and a County collection fee assessed to their property taxes.